The Curly Wirly Twirly Girlies: More berries. Well the weather here in so called sunny Brisbane is hideous, cold and wet. I shouldn’t complain though because we so desperately need the rain to break the drought. I just want it to rain overnight only so I don’t get drenched taking kids to school and ballet. Of course if I was off to sunny Portugal like someone else, then I wouldn’t care LOL. So I kept playing with the berries, I think it is a hankering for spring. I played with some of the new actions I got on the weekend from Atomic Cupcake and also Shauna’s new Commercial Use overlay pack. If this horrid weather keeps up then I will probably veg out in front of the computer a bit this weekend, so I will hopefully get some more bits and bobs done for this, but in the meantime here is the second instalment. Beyond the strawberries, you see raspberries are my favourite, and I have very fond memories of mulberries as a kid. We had a mulberry tree in the backyard of a house we lived in for a year whilst one of ours was being built. I loved that tree. Not just for the mulberries but also because the leaves were in high demand for silk worms. Do kids in other places keep silk worms? Anyway, junior entrepreneur that I was at 8 or 9, I would sell a bunch of leaves for 20c and with a baby silk worm for 50c. High finance. Well better head off, last two chapters of the Secret Seven are waiting to be read. Hooray! My family has a blueberry farm and I have some cute pictures of my kids picking them. Thanks! Thanks, love berries of all kind, though my favorite is the raspberry. Used to go picking raspberries and strawberries when I was younger. Myself and everyone else seemed to put more in their mouths and than reached the buckets. Thanks - I love them. we had silk worms at school every year. once, i got to keep one of the cocoons after the butterflies hatched. i think i may still have it tucked away, lol! you were quite industrius to sell leaves and worms! that beats the heck out of our little table on the corner with oranges for sale. i love all the berries stickers! what else do you have up your talented little sleeve, eh missy? 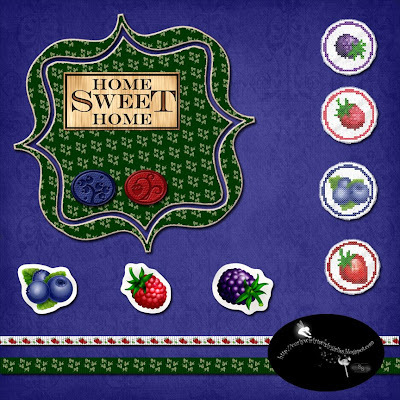 i think i see fruit buttons coming ... don't i? thanks sweetie! mmmmmmm these berries look good enough to eat! Thank You ;) I think I need to go get myself a smoothie now!! Have a Great Day! !